Monologue Show: We’re No Heroes! We’re doing another monologue show! Over the last couple years, Eclectic Voices has produced several monologue shows, Funny How Things Work Out, Abstract Concepts, Signs from the Universe, All Over Again and The Theory of Silence. 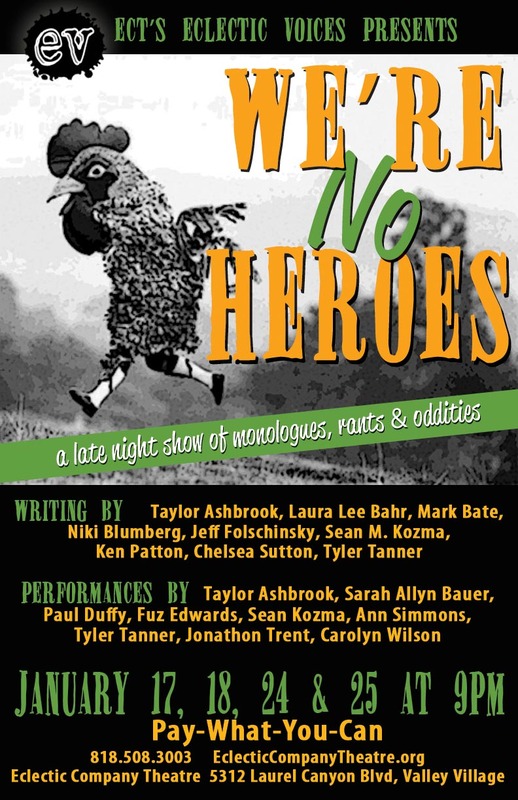 And now, THIS WEEK, on January 17 & 18, and again on January 24 & 25, we’re bringing you our most recent collection of monologues, rants and oddities: We’re No Heroes. It’s a pay-what-you-can sort of thing, and proceeds will go toward funding future readings, productions, publications, maintenance of this website, and other Eclectic Voices activities. If you’re in the LA area, come check it out! You can’t argue with pay-what-you-can, AND it’s at 9pm so it should be well beyond rush hour LA traffic. So basically…no excuses. And if you’re not in LA, spread the word to your LA friends! It’s going to be a fun night. WHERE: The Eclectic Company Theatre, 5312 Laurel Canyon Blvd. (between Chandler and Magnolia), Valley Village, CA 91607. I can’t wait for tonight! Here’s my own post about the experience! This entry was posted on January 13, 2014 by Eclectic Voices in Blog and tagged #newplay, eclectic company theatre, event, monologue, new play, new writer, playwriting, theater, We're No Heroes.